Digital Branding requires you to curate, publish, and distribute a large variety of content, across multiple channels—your role will double as an online branding expert. This means you must work with your client to deliver a website, blogs, social media posts, email marketing, and one that brands them in a positive light. At Etudemy –Digital Branding Institute, apart from marketing, you will also have to look at the entire online profile and search engine results, both positive and negative, of the company—and design a plan to clean up any discrepancies. This means you will need to create a master list of all review sites they are featured on, and periodically “Google” content other than your own to keep a close eye on how outside input is impacting their online perception. This process is referred to as online reputation management (ORM). Since over 70% of customers will perform an online search before doing business with a company, Digital Branding simply can’t be forgotten! If there are no clearly-defined branding goals in place, you can help your client create an online persona that ensures they stand out from their competition. 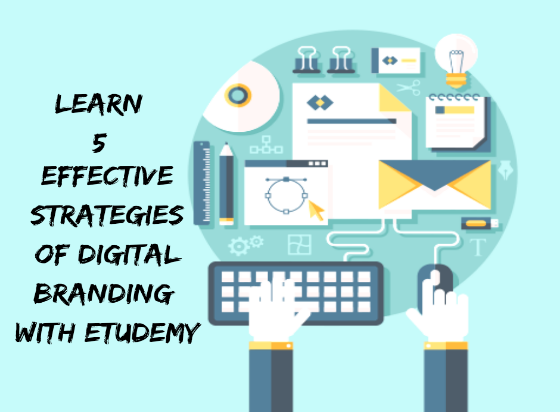 Learn online branding training course from Etudemy-Digital Marketing Institute that has many benefits! You will learn to brand both brick and mortar and online businesses, how to use content and social media to rebrand a business.